As Nigerians prepare for the forthcoming general elections, Rev. Mathew Sukada, Catholic Priest in charge of the Church of Nativity, Kangang, Jos has cautioned Nigerians against killing each over politicians. “Do not kill yourselves over politicians; they do not even know you and will reconcile with each other after the elections, long after you are gone,’’ Mr Sukada told the congregation during the Sunday Service. The Priest particularly cautioned youths in the Church against being used as thugs to kill and destroy. “Politicians seeking to use you for selfish reasons are ready to offer you peanuts to fight and kill on their behalf. “When you get killed, they won’t remember you. When you get injured, they won’t have time for you. And when you are caught, they will deny you. Sukada advised the people to vote according to their conscience, and warned them against selling their votes. “Your vote is your weapon against bad leadership. It is your weapon against injustice. Vote candidates that will listen to you and initiate policies that will promote and protect your interest. “Reject any politician that offers you money to get your vote because such person, if voted into office, will not feel he owes you any responsibility after `purchasing’ your vote. “Nigeria belongs to all of us. We must collectively decide those that should lead us and take charge or our resources because we have enough to go round. “We have had greedy leaders over the years. We must all take a stance to vote in good and responsible leaders for the benefit of all of us and future generations,’’ he said. 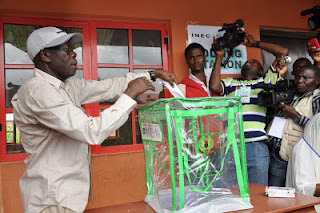 Sukada advised Nigerians yet to collect their Permanent Voter’s Cards (PVCs), to do so “immediately’’, stressing that the PVC was “a very strong weapon no one should toy with’’. He reminded Christians of the injunction to love one another, saying that they should also pray for each other. “We must always pray for each other. We must love each other and be honest with one another. We must remember those in crisis-ridden areas and pray for God’s intervention in the situations they are facing,’’ he said.